Mystic Spa hosted a party to celebrate the launch of ‘Clear Almond Oil’- the latest product offering by Mystic, a chain of lifestyle spas. The Almond Oil is specially used for massage and beauty therapies and was launched by the gracious and dazzling Bollywood actor Karisma Kapoor (Bollywood Diva) at a gala event in Chattarpur Farms, New Delhi. The launch function was graced by the presence of many eminent personalities. To name a few: Adesh Gupta of Liberty Shoes, Sonali Kochhar &Rohit Kochhar of the reputed law firm Kochhar & Company, Shyam Jindal of Fuji Films, Sapna and Rajesh Arean of Gold Souk, Rohit Gupta of Tivoili Gardens, Mrs Kamakshi and Mr Tejinder Nagar of Paras Milk, Rajesh Luthra, Tanushree Garg and Puroshottam Bhageria. Some of the guests were seen enjoying foot massage by Clear Almond Oil by Mystic at the launch. The guests were entertained by a series of spectacular dance performances by Egyptian dance Group known for their special Tanoura folk Dance. The spotlight was on the Clear Almond Oil which Mystic extracts in-house. Clear Almond oil is available for various treatments that include Swedish massage, Balinese Massage, Deep Tissue Massage and LomiLomi at all Mystic outlets. 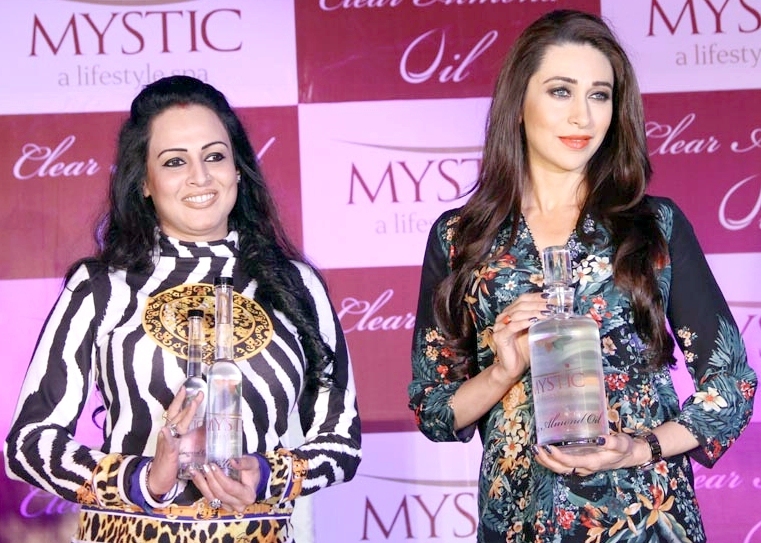 Karisma Kapoor, a world renowned Bollywood actress and one of the most gorgeous beauties in the film industry shared the latest beauty trends and explained the ideal way for skin care with Clear Almond Oil by Mystic- and how the product will benefit the skin. She also shared how own experience at the Mystic Spa that left her refreshed. Almond oil is essentially pale yellow in color when extracted from the kernels. Mystic processes it naturally ensuring low content of Phytic Acid, Tannic Acid and Enzyme Inhibitors which gets absorbed much faster thus giving the desired benefits of almond to the body and skin. The unique feature of Mystic’s Almond Oil is that it is colorless. The Clear Almond Oil rich in Vitamin E ensures that it does not cause any irritation to the skin and is suitable for any skin type. It does not leave the skin oily, does not clog the pores, but moisturizes the skin leaving it soft and radiant. And if used regularly it improves the complexion and restores the health of the skin. द्रोपदी की मर्मान्तक पुकार ! CALL BY ANNA IS POLITICAL?